The Remington Group proudly announced the grand opening of Ruth’s Chris Steak House in Downtown Markham on November 13. The restaurant, located at 170 Enterprise Boulevard and Birchmount Road, is a 7,000-square-foot dining experience like no other. Designed by HCA Architecture of Toronto, the space features an extensive lounge area, a floating bar surrounded by comfortable seating and a dramatic, bold-red curved 15-foot-high ceiling that terminates to significant glazing. During the day, the restaurant features natural light and at night the restaurant emanates light to the outside, animating street life and illustrating the liveliness of Downtown Markham’s growing community. 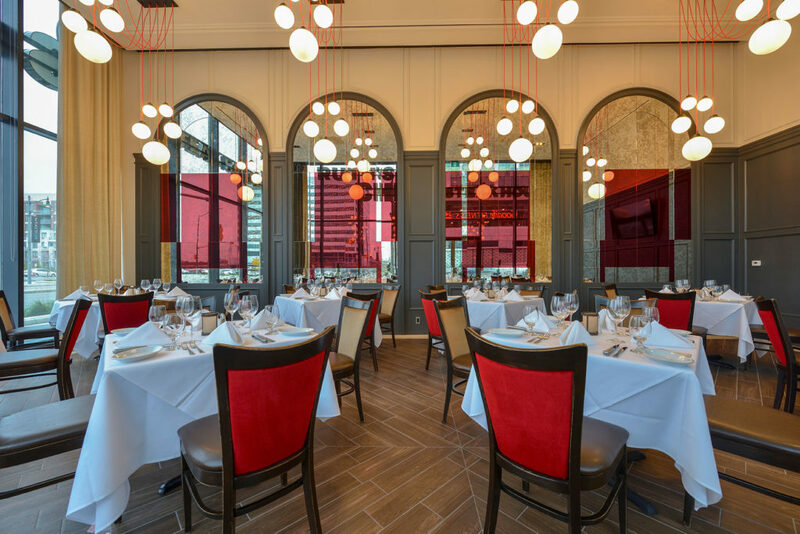 But for patrons of the restaurant, the biggest draw is the food, reinforcing the New Orleans tradition of sizzling steaks, fine wines and exceptional service. Ruth’s Chris Steak House is an important part of Downtown Markham’s vision as a a vibrant, entertaining, culturally infused mixed-use development in the heart of Canada’s High Tech Capital that features over 2 million square feet of retail, dining and a variety of cultural projects, art installations and many kilometres of unblemished outdoor space. Starting November 19, Ruth’s Chris is open for lunch from 11:30 am to 2:30 pm, open for dinner Sunday to Thursday from 4:30 to 10 pm and on Fridays and Saturdays from 4:30 to 10:30 pm. Reservations can be made through www.ruthschris.ca or by phone at 647-794-0170.